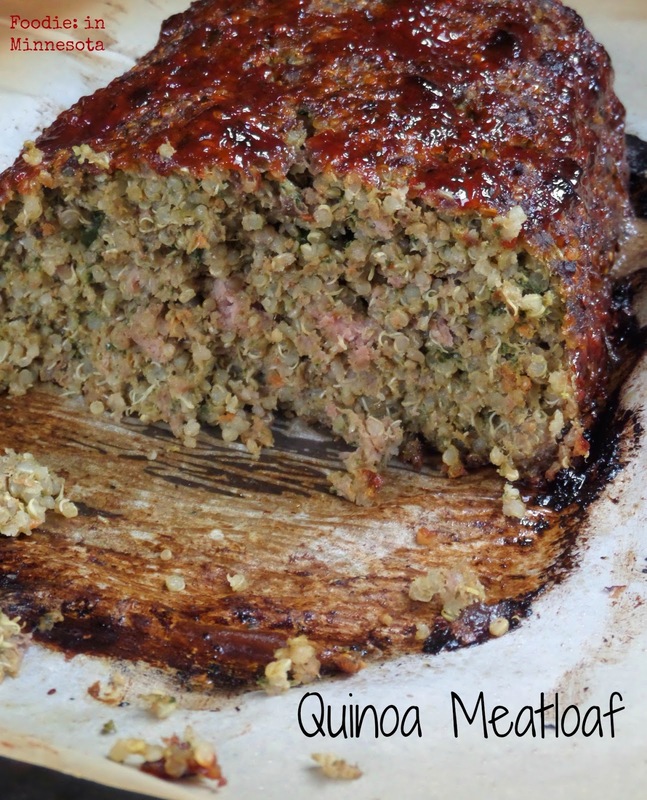 The question "Do your kids eat all that stuff" has been asked of me and got me thinking I need to set the record straight while I'm blogging about Quinoa Meatloaf, which should definitely be kid-friendly, but I may be getting a are you kidding me? from some. To answer the question, yes - they do eat this stuff. My (mostly enforced) rule is that they must take one bite because you never know if your tastebuds grew overnight, it's impolite to refuse food served prepared with love, and you try everything once. If you don't like it, you may say "no thank you." And then there's always a package of Oscar Meyer in the fridge. Hey, I've never liked peas. Ish. I just hate them. I can tolerate them in a curry or alfredo sauce, but give me a pile of peas - no thank you. Other vegetable hate: eggplant. Yuck-o-la. We all have our limits, right? Got a vegetable hater in your house and need some ideas on how to disguise a boatload of vegetables along with protein and fiber from quinoa into meat? This recipe will do the trick! Grab your Cuisinart and get to whirring up the usual suspects - carrot, onion, garlic. Then toss in a couple handfuls of greens, like spinach, kale or beet greens and whir that up, too. Sauté in a pan until reduced and starting to caramelize, then dump into a bowl to cool a bit. When done cooling and you're done serving lunch to the masses (refer to Oscar Meyer comment above), add 1 1/2 pounds of ground meat of choice (I used beef), an egg, and some cooked quinoa. Squirt in some soy sauce, sprinkle in pepper and you're just about done with all this cooking nonsense. Once the meat is stirred gently with your hands form it into a nice loaf shape on a parchment-lined cookie sheet. Grab some ketchup or BBQ and spread that meat love with a dose of sugary goodness. Make sure to pop your loaf into a preheated oven. Don't throw the loaf in before the oven gets nice and toasty, otherwise your loaf is going to split, fall apart, and not be as pretty. Yes, I speak from firsthand experience because I am impatient when it comes to my meatloaf. Welcome to meatloaf that is crusty and caramelized on the outside, not drowning in a loaf pan of greasy juice, like Grandma used to make. The leftovers were simply divine sliced and fried in olive oil. 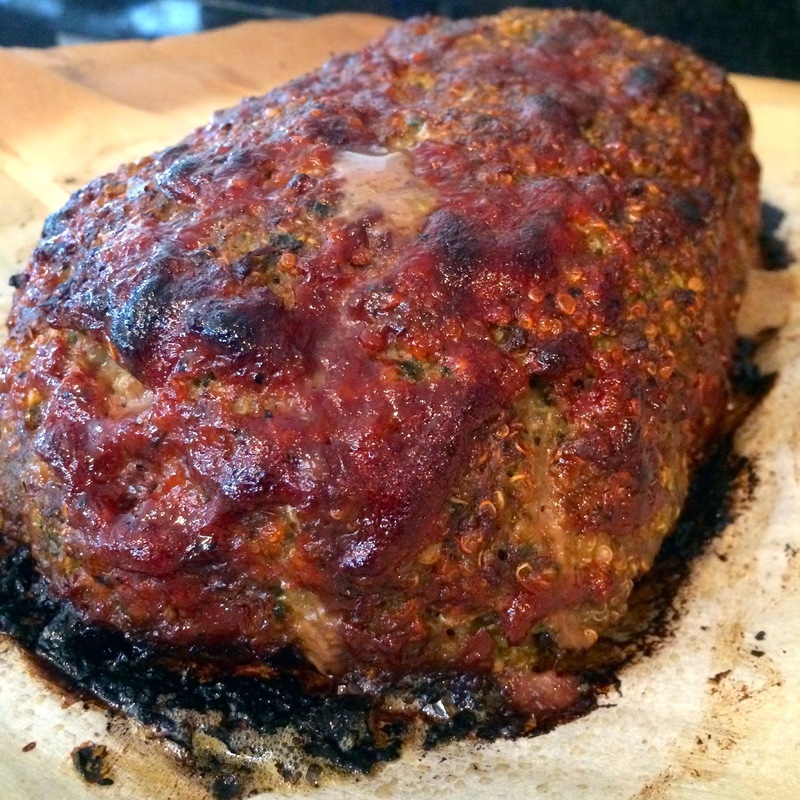 My husband was a fan of this meatloaf because he thought it was more Quinoaloaf than Meatloaf. We all have our limits. Peas, eggplant, too meaty of a loaf, you name it. Do you have any vegetable aversions? Line a small cookie sheet with parchment paper. Set aside. Cook quinoa according to package instructions, set aside to cool. Feed garlic down feed tube of a large food processor while running, run until garlic is finely minced. Add in onion, carrot, celery and pulse until finely chopped. Don't turn into mush, just a fine chop. Pulse in greens. Heat a large non-stick sauté pan over medium heat, add in pureed vegetables and cook until some of the liquid evaporates and vedge begins to brown, about 8-10 minutes. Remove from heat to cool a bit. To a large bowl, add meat, egg, soy sauce, pepper, cooked quinoa and vegetables. Using your hands, combine gently. Don't over mix. Plop mixture onto your lined cookie sheet and get to forming a loaf. Brush ketchup or barbecue sauce over the top. 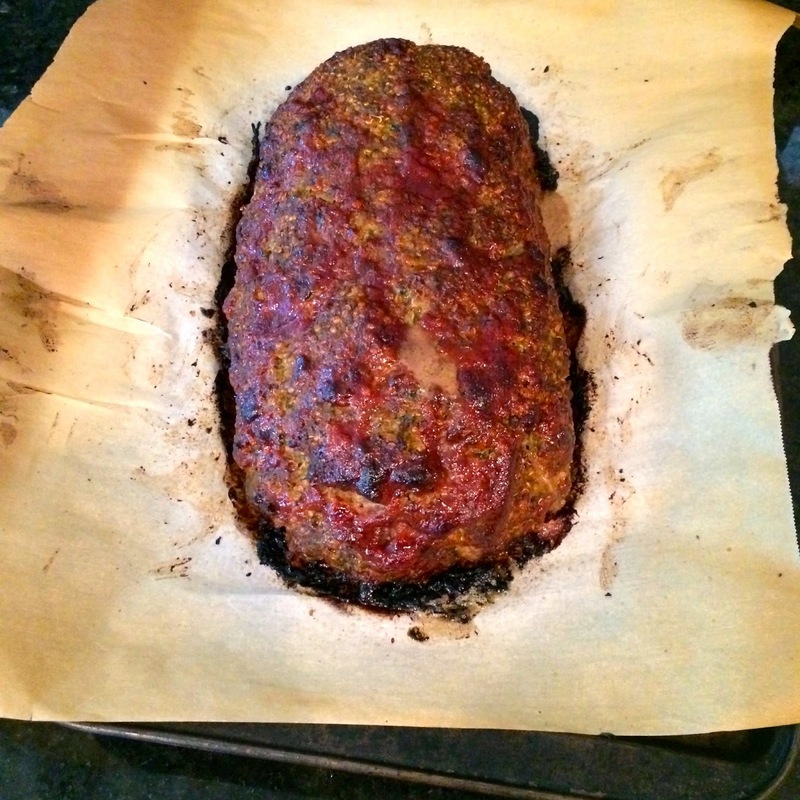 Place meatloaf in the preheated oven. Make sure your oven is preheated, don't skimp on this part - otherwise your meatloaf is going to split open and be sad. Bake for 45-50 minutes. Remove from oven and allow to cool for 5 minutes before slicing. Serve. Slice up leftovers and fry in a little olive oil.